Paul Willer was born in Massena New York, and spent much of his life living in New York City. Paul moved to Nantucket in 1971 with his partner Paul Gaurino, where they owned and operated the Inn “The House of Orange” that sits a few steps up from Main Street. During that time, Paul became a self taught master basket maker who was inspired by Edgar Seeler. Paul’s baskets are very decorative and collectable. One can easily recognize Paul’s baskets because of the consistency of fine craftsmanship. Each basket is constructed with flat oak staves, finished with yellow shellac and has rims that are not nailed. Many times you will see delicate double handles with bone knobs. Paul has made over 2000 baskets of many different shapes and designs in his career including bud vases, candy dishes, salts and cracker baskets. While he has never made a traditional ladies covered handbag, he did design his own version of a ditty bag with a cloth closure. Many of his items sold through local merchant Judy Hill of Hills of Nantucket. Paul and Peter sold The House of Orange in 2004 and Paul has since retired from weaving. Although Paul was asked many times, he never taught anyone how to weave. 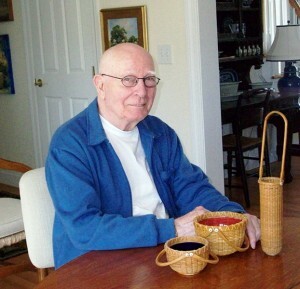 The Nantucket Lightship Basket Museum is very grateful to Peter and Paul for donating several baskets by Paul Willer to add to our permanent collection.